At Dirt Works we have the skills and equipment to pour your new concrete foundation or repair an old foundation with problems. Here in the Kansas City area we get a lot of precipitation in the form of rain or snow. This precipitation can cause drainage problems for homes. 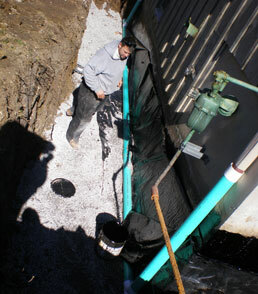 At Dirt Works we design proper drainage systems for storm water and have installed several drainage systems at the footings level to relieve basements from water. 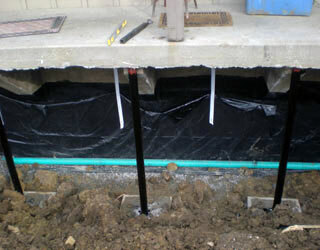 From indoor sump pump systems to exterior drainage systems, we install both to move water away from basement walls and foundations. Finally, we install drain systems to existing guttering to allow water to properly flow away from your home to a drain box or hill side. 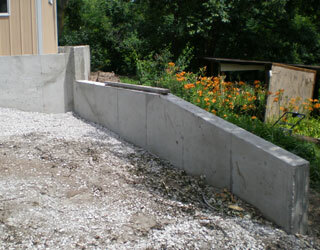 With all of the rolling hills here in the Kansas City area, retaining walls are a necessity on several building lots. 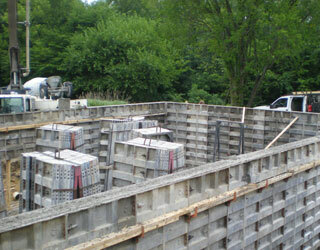 An properly built retaining wall will last decades allowing you to use all the space on your home's lot. We will remove existing dirt, and install the proper barricades and retaining wall supports to ensure you have a properly installed retaining wall. The foundation of a home is what everything else in the structure sits on. We can excavate a trench for your foundation and pour the necessary concrete to ensure your new home or shop starts off with the proper footings. We also will excavate and haul away the dirt for your basement so we can set up wall forms for the final pour of your concrete. Over time exterior pressure from dirt and other forces of nature can cause cracks or heaving in basement walls. For homes with these problems we have the ability to rear out and replace cracking and heaving basement walls. We can excavate the dirt for a new driveway or sidewalk, or remove old sidewalks and driveways and haul away the excess. Call Dirt Works today for your Kansas City Concrete Foundations and Repair needs.